My original draft of this entry became too long. 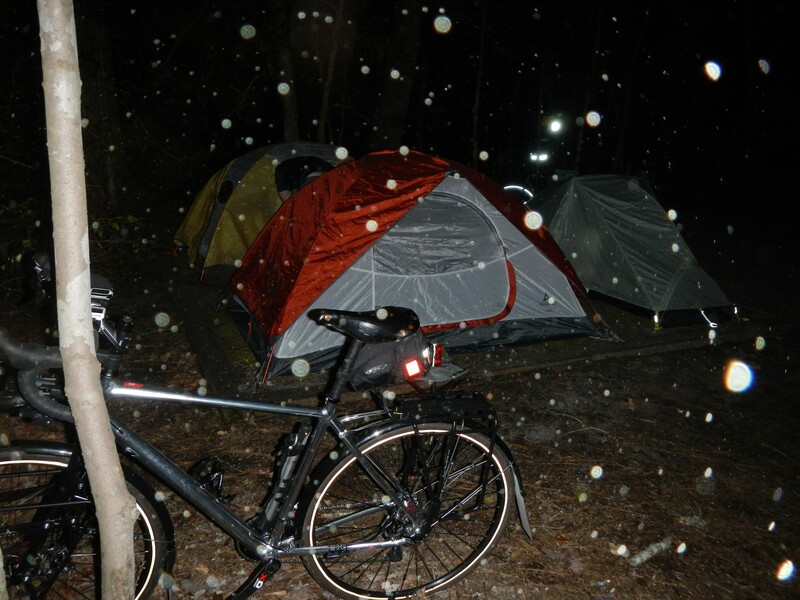 So I split it into the previous “Preparing for My First Bike Camping Trip” entry and this one, the actual trip report. 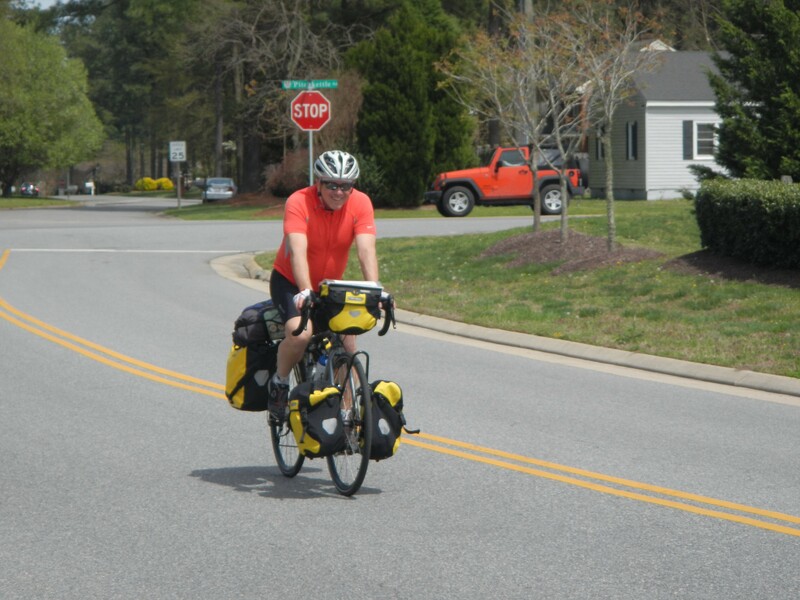 Eight riders met at our starting point in Smithfield, VA: Scott B. (organizer), CJ, Paul K., John S., Robb M., Bob & Emily A., and myself. It was interesting to see the various setups (photos below). 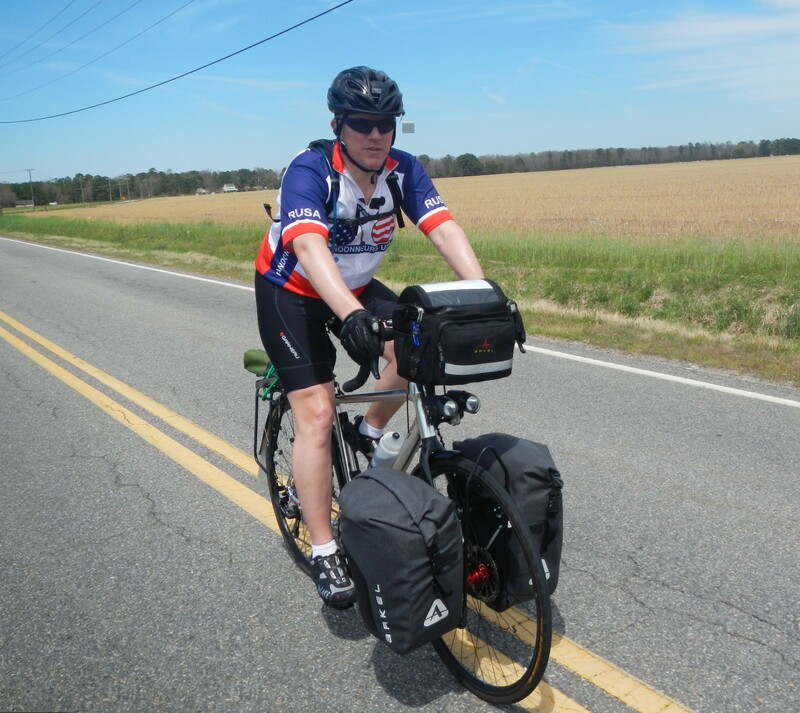 Scott and CJ had full pannier sets; John, Bob and Emily had rear-only setups (and John was on a mountain bike); Paul towed a trailer with his road bike; and, as already shared, I had a front-only setup. John, Paul and I were new to touring. The weather was PERFECT at our noon departure time. It was around 70 degrees and expected to warm just a little more. The wind was light. Armed with cue sheets and/or Ride w/GPS files, we left shortly after 12:00 pm and stayed together for the first five miles. 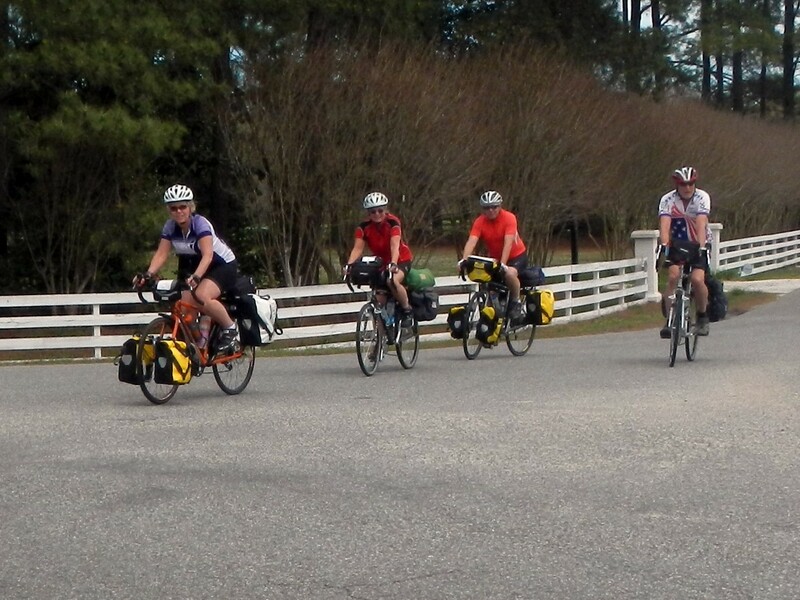 Riding in a group of loaded bicycles is sort of like group climbing; pacelines don’t really work and each rider has to find a speed that’s ideal for them. That may be 15 mph for some and 10 mph for others. As a result, our riders spread out into smaller groups of two or three. 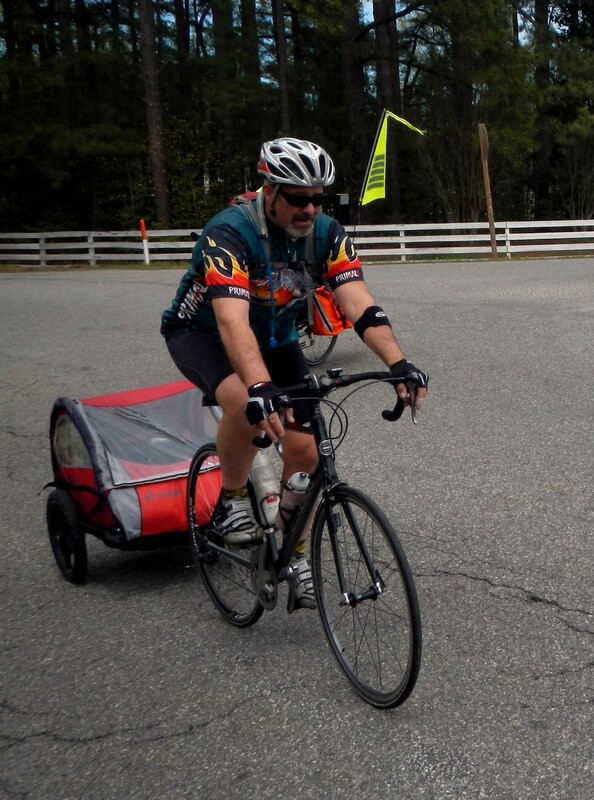 I was most comfortable around 14 mph. 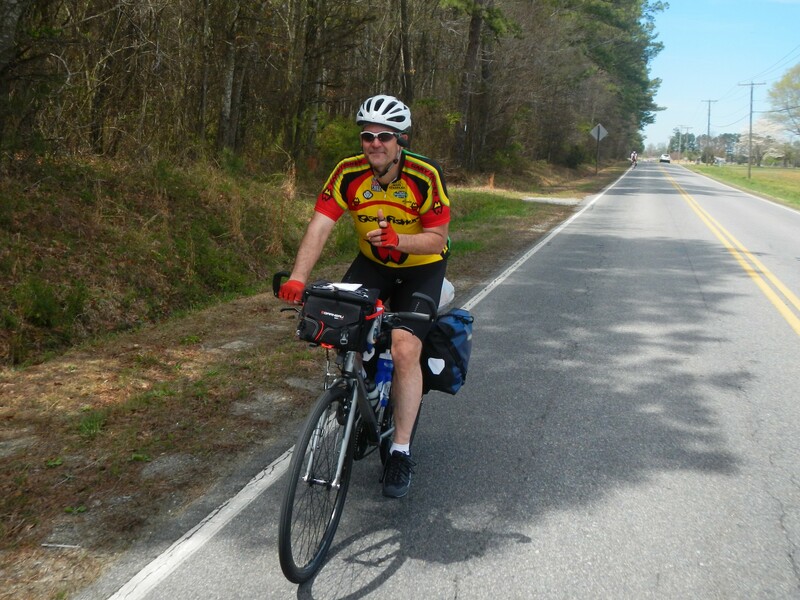 Scott B. encouraged us to ride at our desired speeds and simply proceed to the campsites when we arrived. We still opted to regroup from time to time. Our only stop for food and drink was a tiny store in Suffolk. It had the word “superior” in its name, so it must’ve been good, right? Wrong! I picked up some water and Gatorade. I had other food in my bag already. 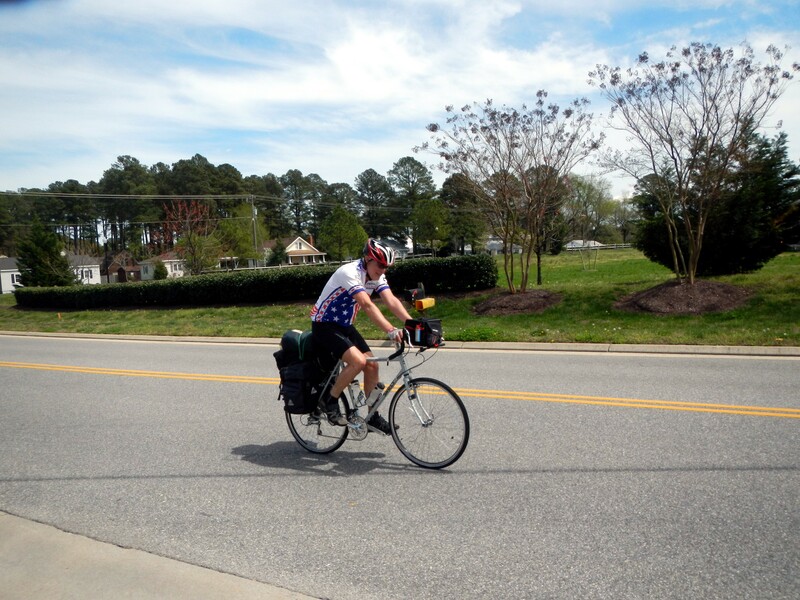 The roads were relatively free of traffic and the ride was easy at my pace. The social pace and light traffic made it easy to chat with other riders. I enjoyed conversations with two riders who were new to me. 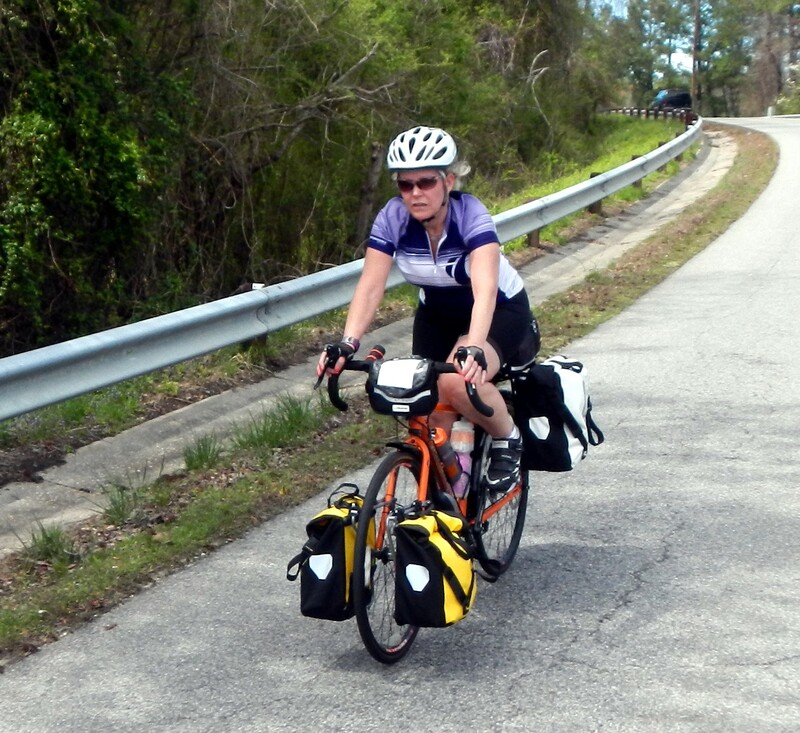 CJ provided a painful account of her bicycle crash last May during which she broke a femur in several places. She wound up with a titanium rod and at least one screw in her leg. 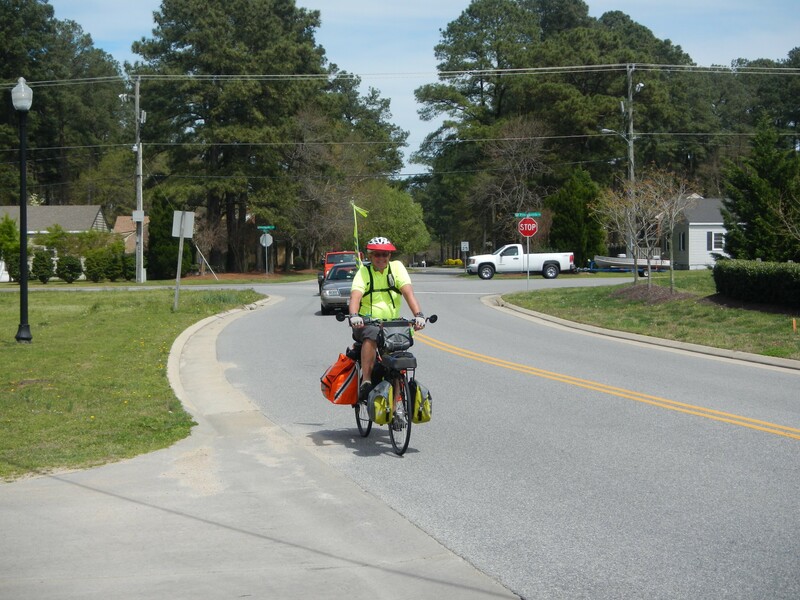 But that didn’t stop her from getting back on her bike before she could walk without a cane. Now, less than a year later, she’s riding a loaded bike and camping. I found her resolve to be amazing, not to mention the advances in medical treatment which helped make her recovery possible! 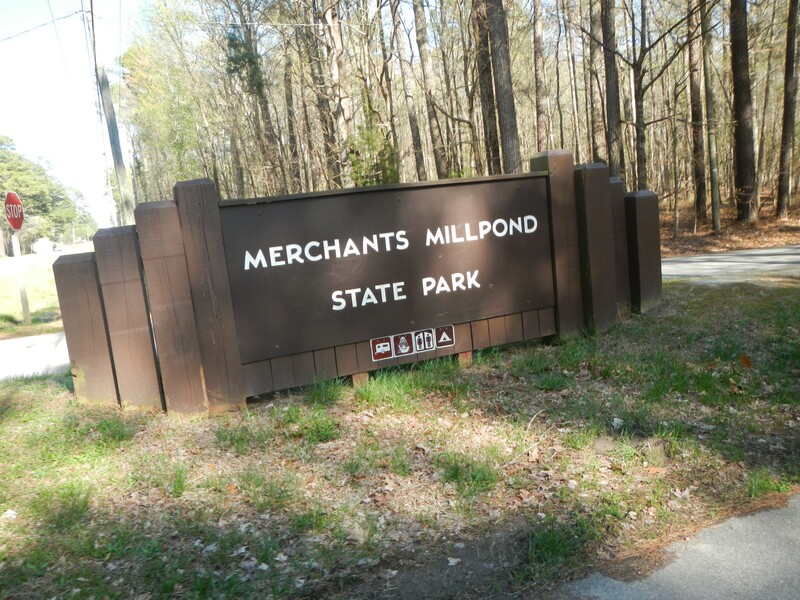 We arrived at Merchants Millpond State Park around 4:30pm and set up camp in three different camp sites. I shared a pad with Scott and CJ. After setting up, I cleaned myself with bath wipes and put on some gym clothes. A hot shower would have been nicer. But I’m told the water wasn’t hot, anyway, just warm. I think the wipes were probably almost as good. Once dressed, we gathered fallen tree branches to build a fire. Our collection of wood was HUGE. I had no idea it would be gone in three hours. Scott B. ate an MRE for dinner, while CJ and I had brought packaged snacks. Sure, my choice was not entirely wholesome. But I figured I’d survive for just one evening. I’ll keep the MRE’s in mind in the future. 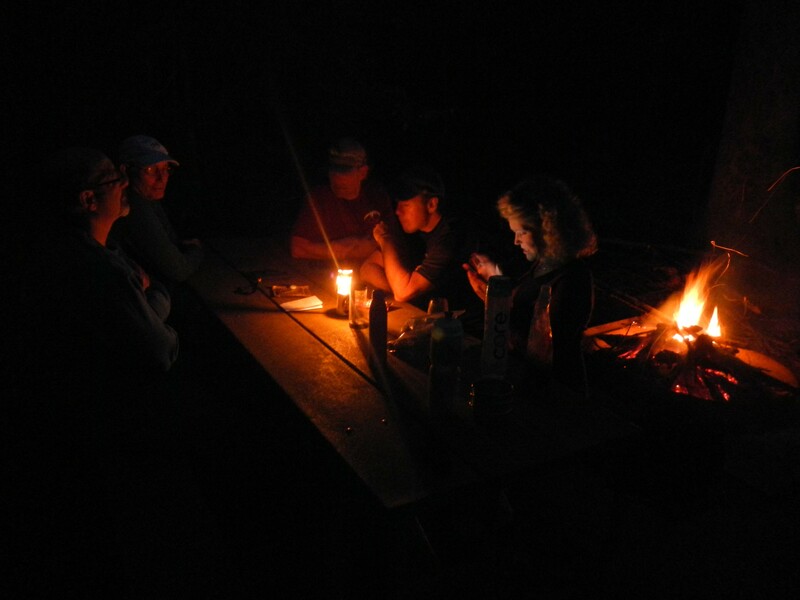 Later, all eight of us gathered at our site for the fire and some visiting. Riders slowly trickled back to their sites as the evening progressed. I’m no night owl, but good company made staying up until about 11pm enjoyable. I quickly learned that “mummy” sleeping bags are not for me. I had chosen an extra-large model. It looked huge on the hanger at the store. Once inside, there was very little room to move around. I don’t sleep on my back, which is the mummy bag’s primary design. I move around a lot and prefer sleeping on my side or stomach. Lesson learned! I also found the nylon to be distracting. I’ll get an extra-large rectangular bag with flannel interior and pay the weight penalty for the added comfort. I did get a little cold, since my sleeping position did not maximize the mummy bag’s heat retention. 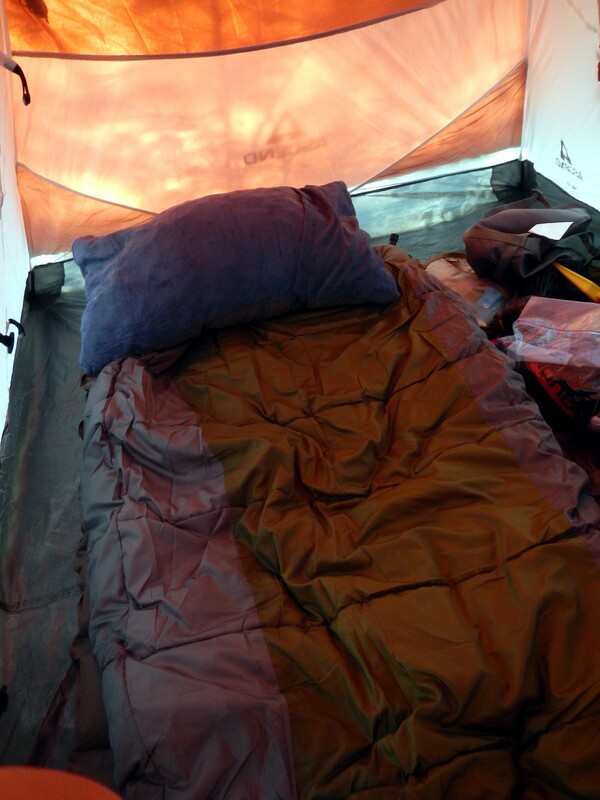 I still slept well enough, but I think I could have slept like a rock if I was in a larger bag. I’ll find out next time. Yes, there will be a next time. There were two things I wanted to see since I hadn’t camped in many years: 1) Could I carry what I needed on the bike and 2) could I sleep comfortably in a sleeping bag on a pad. I answered YES to both of those questions. Birds and daylight woke me at about 6:30am. I wasn’t ready to get up, so I dozed for about 45 minutes or so. I started packing my things when I heard Scott and CJ stirring in their tents. Scott had brought a tiny camp stove and heated water for oatmeal and coffee. I had a Clif Bar and was optimistic that the store ten miles into our route would have food. The other riders hit the road about 30-45 minutes ahead of us. We left the park at 9am. It was a bit cooler than Saturday. The wind was blowing from the north, right into our faces. We pressed on. Holding out for breakfast was a great idea! The Citgo in Whaleyville, VA had a deli that made breakfast items to order. 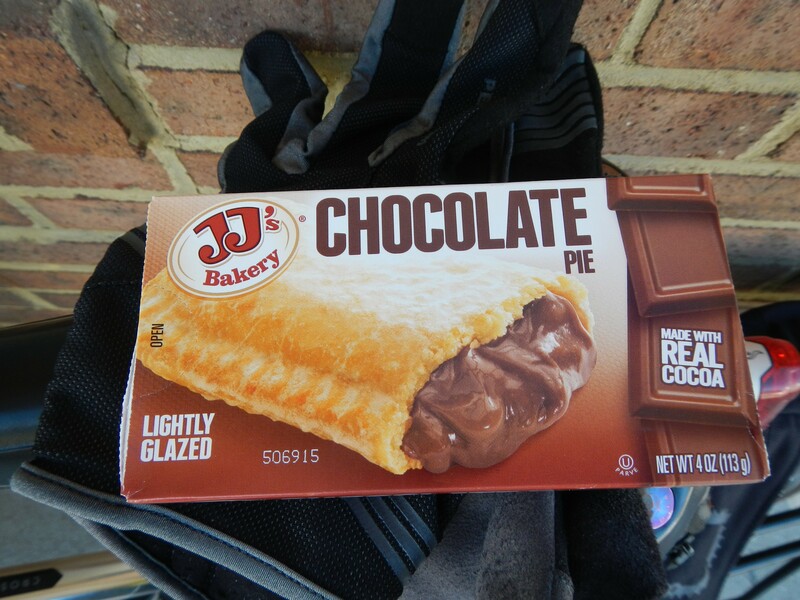 I had a delicious sausage, egg and cheese sandwich and picked up a chocolate pie to eat later. 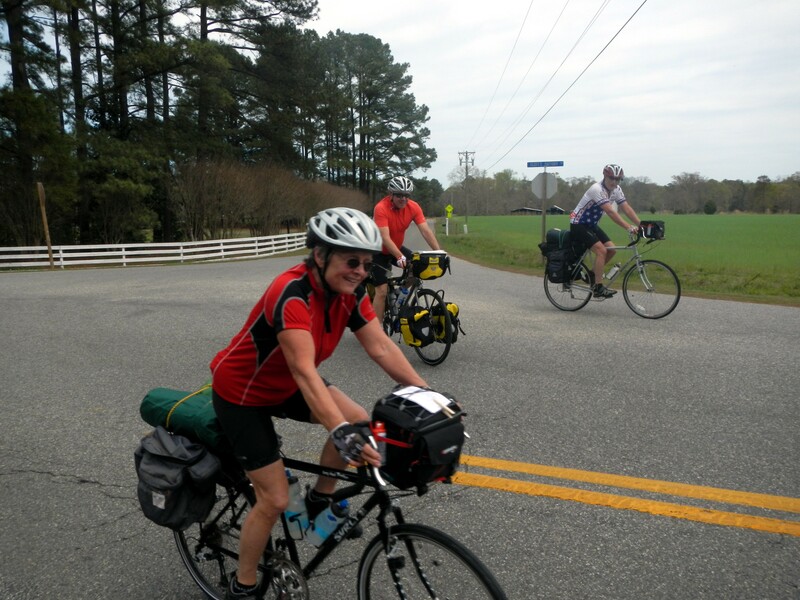 We met another bicycle tourist as we left the Citgo. 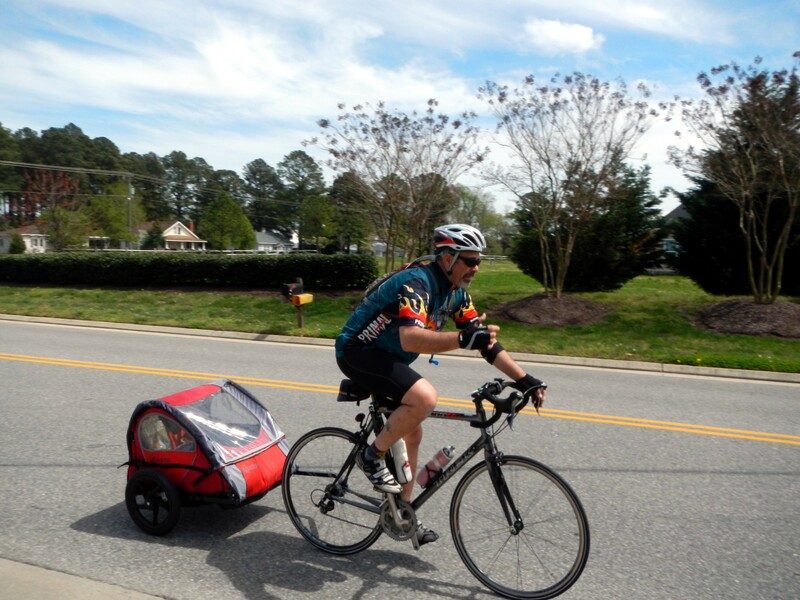 He had been on the road for about 19 months and was on his way to Virginia Beach. 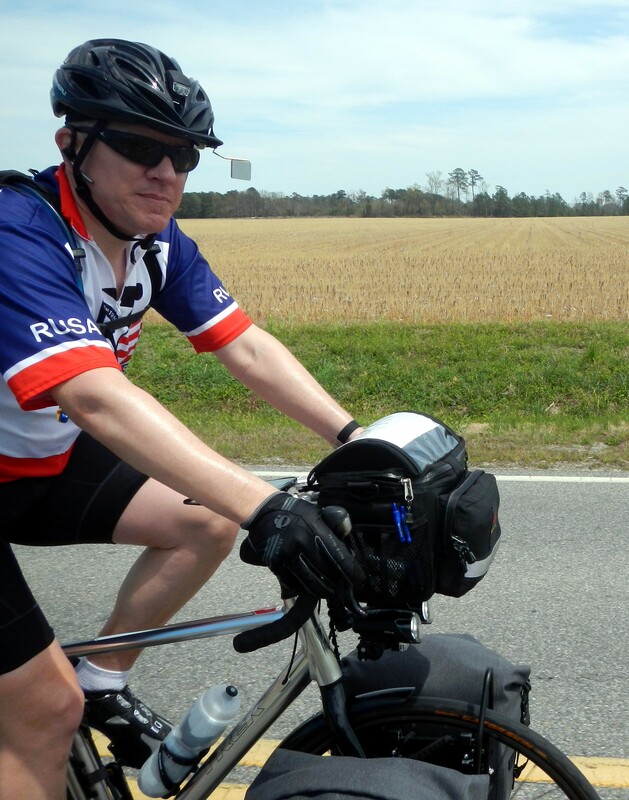 He had started a long tour and then decided to ride through all 48 CONUS states. Unfortunately, his decision to ride the lower-48 must’ve happened after he was too far east to get Wisconsin and the Dakotas along the way. 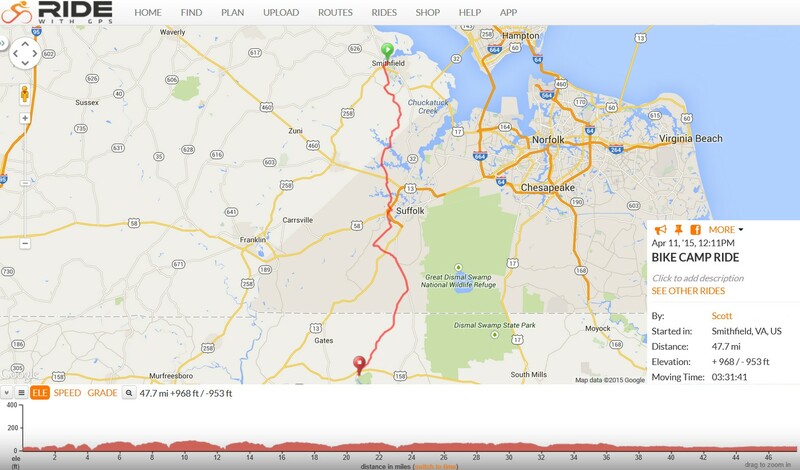 He plans to ride to NY, get a job to pay for a new bike, and then backtrack to those states. What then? Who knows? The rest of our ride was fairly uneventful. We stopped at the “superior” store for more water and Gatorade. We also peeled off some layers. I ate my pie. The other riders finished about 45-60 minutes ahead of us, except for Robb. We caught up with him about five miles from the end. We returned to Smithfield at 2pm, packed-up and said our goodbyes. 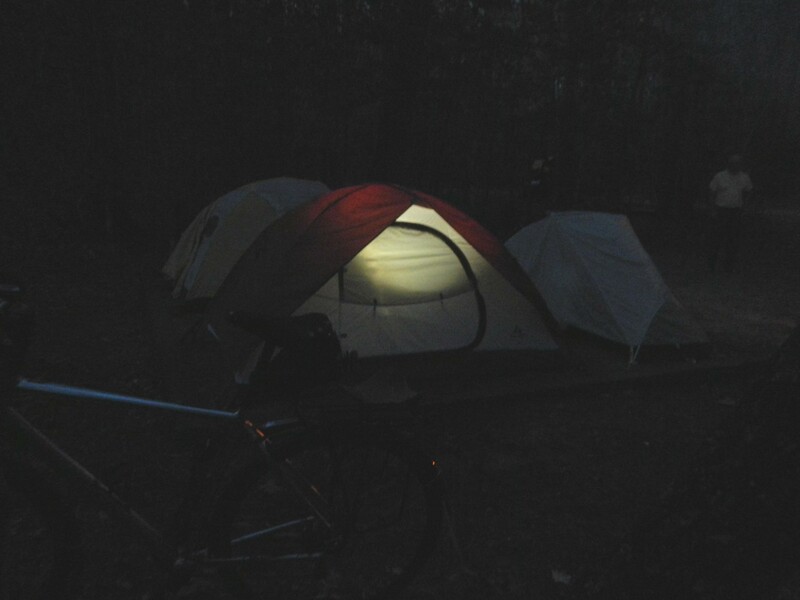 Overall, I’d say my first weekend bicycle camping trip was a success! None of my lessons-learned were tough ones. It’s not like I left underwear behind or forgot my sleeping bag. Plus, I returned with everything I took (except for food). I’d call it a win! 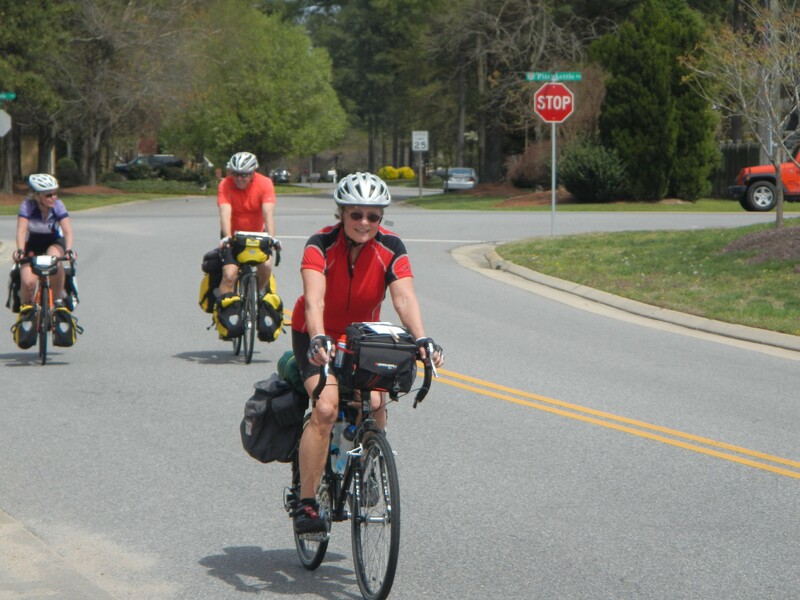 The driving idea behind this “Intro to Touring” was to build a core of touring bicyclists in our club. I’m not sure if I’ll be available for a weeklong ride in the near future. But I’m definitely game for another weekend outing. Count me in! What did you think of the Arkel Orca panniers? 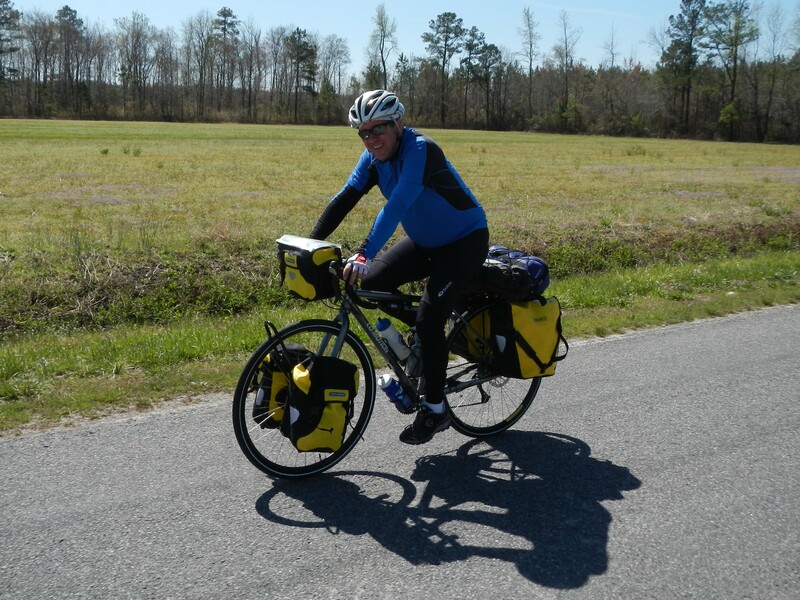 I’ve been taking a look at panniers to by for an upcoming touring trip and the Arkel Orca looked really durable to me. Spencer – I like them a lot. I have no experience with other bags. So I’m oblivious to what I may be missing. But I can confidently say that the Arkels are durable, adjustable, and I have no reason to doubt their waterproof integrity. 🙂 Some people don’t care for their dark color. I think the dark will hide flaws and/or dirt marks that are bound to happen to heavily-used panniers. In other words, they should look as they currently do for a very long time.